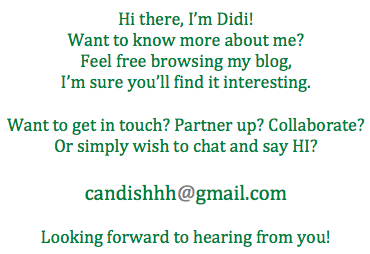 the canDIshhh tales: Starbucks Coffee Appreciation Festival on April 2 & 3!! 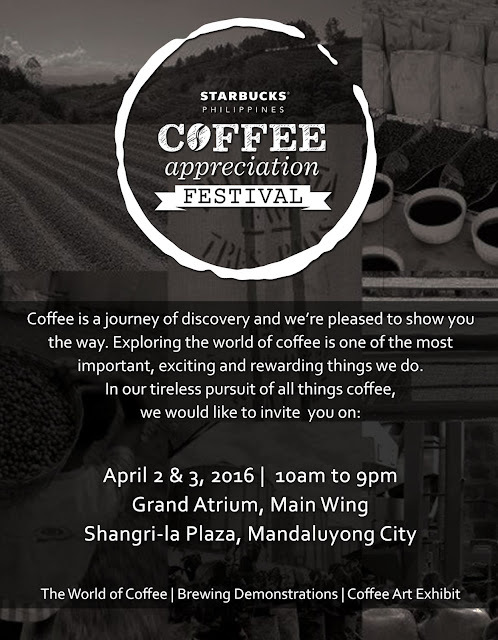 Starbucks Coffee Appreciation Festival on April 2 & 3!! There's a Starbucks Coffee Appreciation Festival happening this weekend, YES - this weekend! April 2 & 3 at the Grand Atrium Main Wing of the Shangri-La Mall. Life is made enjoyable with many fine things, and one of the finer things in life is appreciating a good cup of coffee. But coffee appreciation doesn’t begin and end with the cup; it starts with growing the finest beans then the coffee processing, roasting, brewing and, finally handcrafting every cup. The key to appreciating good coffee lies in knowing the story and the art involved in creating every cup before you can enjoy it with your friends and loved ones, or alone with a book on a warm couch. Whether you prefer your coffee full-bodied with a bold flavor or lightly-roasted with mellow notes, you can now enjoy the full spectrum of flavors that coffee offers at the Starbucks Coffee Appreciation Festival from April 2 to 3, 10am to 9pm at the Grand Atrium, Shangri-La Plaza. This two-day coffee exploration event showcases the world of coffee, featuring everything you can possibly know about the world’s most popular beverage, from its history to the world’s renowned coffee-growing regions, types of coffee beans to the processing methods and down to the Starbucks Roast™. “We will be equipping participants with the right coffee knowledge and this requires going back in time and understanding the storied origins of coffee. We will also give coffee enthusiasts a peak into the regions where coffee beans grow best, what type of beans are cultivated in different origin countries and how the geographical conditions of these places affect the quality and flavor of the coffee bean,” said Keith Cole, head of marketing for Rustan Coffee Corporation (Starbucks Philippines). Participants will also experience how to unlock the full potential of coffee for the perfect cup every time, with four basic fundamentals of brewing – the right proportion of coffee to water, different grind levels, clean water at the right temperature and freshness of coffee. Another highlight of the event is that participants will be treated to brewing demonstrations and coffee tasting activities. This is when coffee drinkers are taught to better appreciate the nuances of the flavors of coffee including a cup’s aroma, acidity and body. Starbucks Global Coffee Masters will lead coffee tastings to demonstrate how to smell, slurp, locate flavors on the tongue and describe coffee characteristics. The brewing demonstration will include methods such as the Pour-Over and the classic Coffee Press. Brewing with a coffee press retains the precious natural oils that paper filters absorb, and extracts the coffee’s full flavor while giving it a consistency that’s thick and rich. While the Pour-over is a beautifully simple and accessible way to brew a single cup of coffee with clean, fully developed flavor and body. “The pour over is a great solution for producing a flawless cup of coffee every time as it allows you to control the flow of water and ultimately the depth of coffee flavor. While the coffee press is one of the simplest ways to brew coffee, it releases more of the coffee’s natural oils into your cup instead of into a paper filter, which means more flavor,” says Cole. “Filipinos are learning to appreciate the diverse world of coffee. Our goal in staging our very first Starbucks Coffee Appreciation Festival is to help coffee enthusiasts better appreciate the story and the art that goes into every cup, from the bean to the region where the coffee bean grew to the brewing process to the preparation of the beverage. So much goes into one cup of Starbucks coffee and we know that with appreciation, the beverage itself tastes better as the coffee drinker is better able to appreciate coffee as more than just a beverage,” said Cole. First 500 participants that complete the coffee journey get an exclusive Starbucks Explorer Kit! Hail, Sultan Grill San Juan! Bento Mommas: Happy Birthday Kailee! Pet Express: DOGGIE RUN 2016!